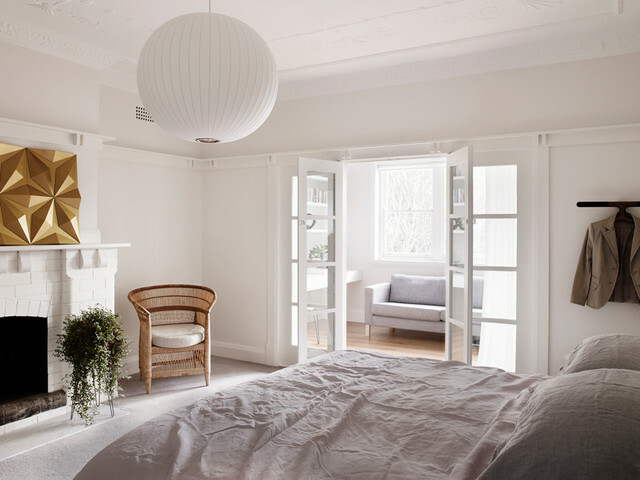 Throughout the house, the original features have been cleverly reused – the architraves, skirting boards and doors have been painstakingly restored, as has the original ceiling plasterwork. Much of the flooring, and many of the doors and window fittings, were retained and restored to keep as much of the Art Deco detailing as possible.The master bedroom, complete with updated fireplace, leads into the sunroom. “It’s unusual to have a sunroom leading from the master bedroom. However, this layout allowed us to retain much of the existing building fabric, such as the cornices and ornate ceilings,” says Hudson. Property Styling to BEELIAR WA 6164.